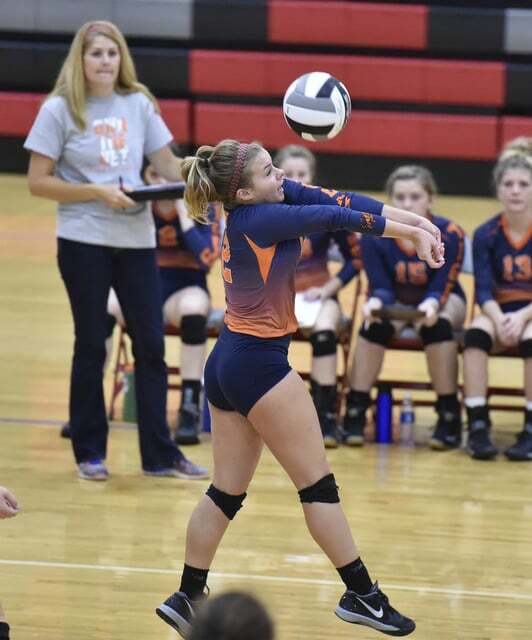 DELAWARE — Galion dropped a 25-16, 22-25, 22-25, 23-25 decision to Buckeye Valley in Mid-Ohio Athletic Conference play. Top servers for Galion were Chloe McCleese, Callie Wildenthaler and Ashley Flowers. McCleese was a perfect 19/19 with 11 points, Wildenthaler went 16/17 with 12 points and an ace and Flowers recorded two aces and nine points on 11/13 serving. Morgan Gregory, who went 117/119 handling the ball with 41 assists. Marisa Gwinner was 34/42 hitting on the night with 16 kills and Gabby Abouhassan went 24/29 on the attack, recording 10 kills. Overall, the Tigers’ spikers notched 45 kills against Buckeye Valley. MARION — The Galion Tigers boys soccer program traveled to Marion on Thursday to take on Mid-Ohio Athletic Conference foe Marion Harding, but came up short, 3-1. Lucas Conner scored the lone goal for Galion, on an assist from Max Papenhausen. The score was just 1-0 in favor of Marion at the half of the rainy match. That first goal wasn’t even scored until about three minutes remained. The Presidents were just too much for the Tigers in the second half on their way to the victory. “The defensive line of Max Papenhausen, Landon Rose and Ethan Zeger did a good job of keeping Marion’s attack at bay,” said coach John Stewart in an e-mail. Stephen Thompson was once again the goalkeeper for Galion on the night and finished with nine total saves. The Tigers will be in action again on Wednesday Oct.5 when they take on Highland in league play. GALION — The Northmor Knights welcomed the Centerburg Trojans to their home gym on Thursday to do battle atop the Mid-Ohio Athletic Conference Blue Division. A battle is exactly what the match was, going all five sets and eventually ended in a victory for Northmor; 25-23, 26-28, 25-20, 20-25, 15-12. Kelsie Fike and Anna Donner lead the attack for the Knights. Fike went 48/54 hitting with 18 kills while Donner went 53/60 with 16 kills of her own. Jordyn MZoll, Chloe was 108/115 setting with 39 assists for the match. Donner, Zoll and Fike were perfect from the line to hit on 70/70 serves. MOUNT BLANCHARD — The Galion Tigers girls soccer team continued their introductory season on Wednesday night against the Riverdale Falcons. Galion was again unable to grab that first win in the program’s history, falling to Riverdale 10-0. Allison DeNero had 11 saves on the evening for coach Eric Palmer’s Tigers. The final game of the season for Galion is Oct. 5 at Highland. MARION — Galion lost to Marion Harding 19-25, 22-25, 15-25. Marisa Gwiner was 25/27 hitting on the night and recorded 13 kills. With those 13 kills, Gwinner cracked the 200 kill mark on the year and has 206 so far. Gabby Abouhassan contributed 13/15 hitting with five kills and Morgan Gregory was a perfect 5/5 on the attack with five kills. Gregory was 82/85 ball handling, with 28 assists for the Tigers. CARDINGTON — Cardington defeated the Knights21-25, 25-27, 25-14, 22-25. Kelsie Fike and Anna Donner were busy all over the court and were Northmor’s serving leaders on the evening. Kelsie Fike was a perfect 17/17 from the line with three aces. Anna Donner was also 17/17 and recorded two aces. Jordyn Zoll was 16/16 with an ace and Caitlin Thebeault was also 17/17 serving. Donner had 25 digs on the night while Zoll dug out 13 of Cardington’s attacks. Lindsey Wiseman had the most digs on the night with 26. “I’m proud of the year that we had,” said coach Mark Barrier. “We set personal records and set the team scoring record,” he continued.